Any timeframe for that? Or is it submittet to apple already? I will submit on next week. 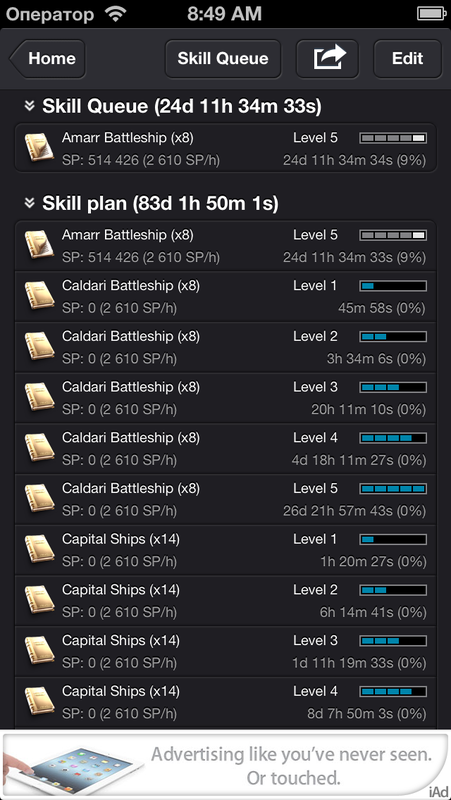 Any chance to have in the near future cloud sync (for the skill planner for example) between iPhone and iPad apps? Looks great and can't wait for the update. Incoming donation! Awesome, can't wait to use it! Уже просто не могу дождаться, по десять раз на дню проверяю обновления. Bug report for the current version: the access difficulty bonus for salvage drones is waaaaaaay off compared to what's shown in-game (e.g. 117% in Neocom vs 9% in-game, at SDO III). Looking forward to the new version! Артём, подскажи плз, никак не могу разобраться - что значат жёлтые круги и зелёные галки на модулях в фиттинге ? Думал, что это типа "best in slot", но это, видимо, не правильно. Это разный статус модулей. Активные, перегретые и прочее. Absolutely love this app - amazing work! One thing though - any chance we'll see the "required for" info or skills any time soon? I'd love that! Any idea when the update will be released by Apple? Artem, you are awesome and i love you. 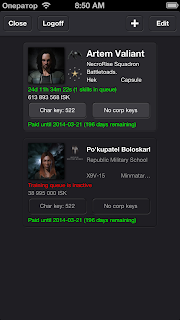 this is my favorite eve app. i use it on ipad and cant say enough good things about it. i'm glad you are continuing to develop it. Thank you for Neocom, Artem! Update in. Look reallllyyy great. Keep up the good work. I can confirm that the scheme works great on newer devices (specifically, iphone 4S and above), but it's not working for the older ones. The account selection is fine on ipad 3 as well, though, so I suggest you use that grey for the rest of the colouring and we'll be fine. Excellent work! Just donated, thanks so much for this app. Tiny thing though, it's been misspelt "Characers" on the main screen. Also, please please add the "required for" info to skills, it's so useful! 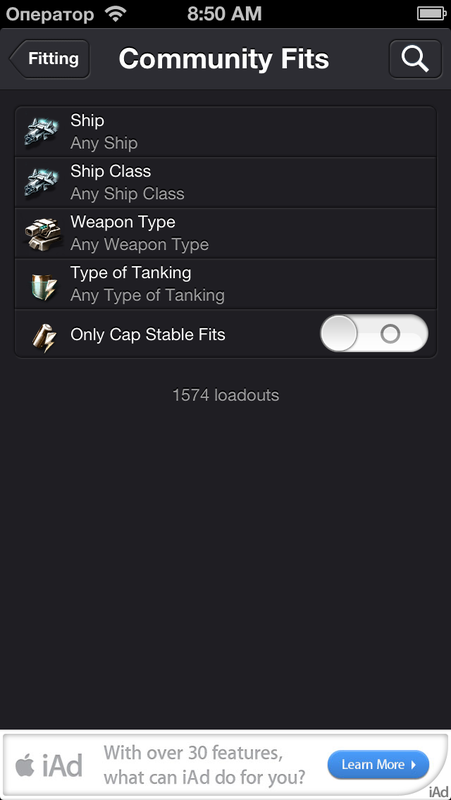 Wait, now we can't click the little arrow to "show info" before we select a ship/module/skill etc? That's not very good..
Has support for the original iPad been stopped now mate? No update on app store for it but got it on my phone already. Any plans to make it available on iOS 5? My ipod can only use that OS. 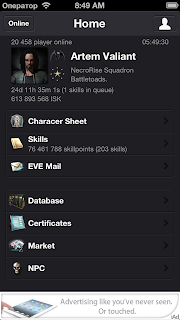 The 'show info' option also needs to be restored, the app is nigh on useless for people who are newer to Eve without it. There is a bug in the character sheet on my iPad with ios 6. When I open the character sheet the close button doesn't work so I need to close and open the app to be able to use it again. Would love to see this ported to OSX for desk top. Then add cloud sync between apps. Thanks. Beyond that, really loving new version. Echo statements from above. App was working perfectly but post ios7 upgrade the white on white colour scheme is unusable. I also can't seem to find a way to enter my API details. Tried deleting app, rebooting device and reinstalling but it's still broken. Please fix this is an awesome app that I use daily. My device is an ipad mini. Thanks for the quick fix. New update is looking much better on iOS7 on ipad mini. The app doesn't save , when i mark the Messages as read. (New Bug) Some of the backgrounds are not shaded in and remain white. 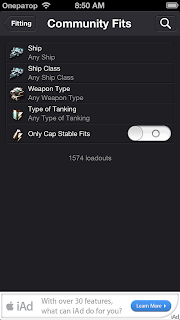 For example, when I select the skills tab or ship loadouts I have done, the white text appears on a white background instead of a shaded in background. Still, love the program though. Just waiting for the 3.0.1 version now. Seconding that read mails do not stay read. Also, could we please have the "All Skills" categories collapsed instead of expanded? It's much easier to navigate that way instead of having to scroll through everything. Oh I forgot to mention that the eve-kill.net reports do not work at all on my iPhone 5. I can't seem to input any text in the white input field. After further testing it seems I can input text only that it's not visible (white on white). 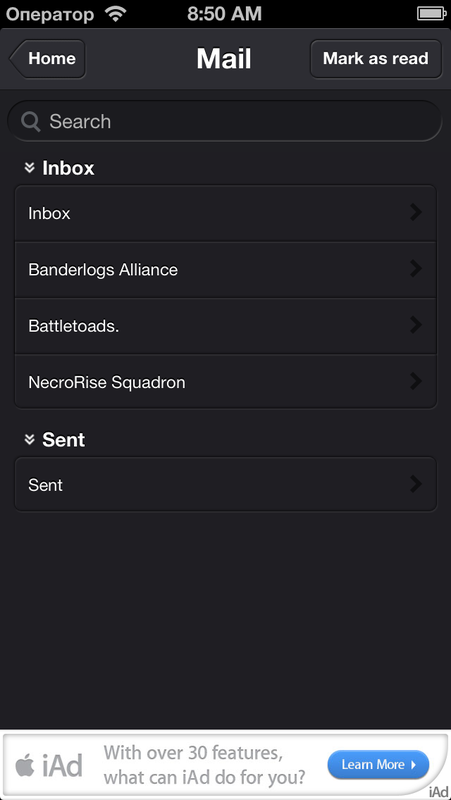 Also please give us back the link for automatically inputting your pilots name/corp/alliance. Alternatively just add links ready to click at the top, that would be excellent. How do I remove the access mask? Thanks for all your time and efforts, this is a great app. Hope the bugs get resolved soon! Running on IOS6.1.3 iPhone 4S. And the app works Great. Sad to hear ppl have problems with IOS7 I would down great back to 6.1.3 no problems there.. Only one tiny thing is mail keeps saying new. But for the rest keep up the good work Artem. But, I found bag in Database, select item (ex.Coolant) and tap Market, tap search bar, then bar was whiteout. I try it on iPhone5 and iPad 4th Gen. This is looking really good! I'd like to report a bug for fitting screen options. When I use a search on module types I cannot leave the search listing as there is no back button. I dont tell you now whats not good i think the most people her have already reported the bugs. But pleas give us some information about the timeline. how long does it takes to fix the stuff? Thx for the very good work you already done. Ios 6.1.2 on ipad here. Else, thanks ... Great App! Can't clear cache.. And market keeps crashing as said above. All other stuff working fine so far I know. I would love to see a jump planner in a future release. Keep up the goods work. Using an Ipad Gen 4 with iOS 6.1.3 (not ready to upgrade to 7), and every time I select an item in the market...it crashes to home screen. Also, once I select character sheet, the close button does not work, nor will anything else respond. Cleared cache as suggested here..no joy. Only way to make the app come back is a full shutdown/restart of app. Thanks for fixing the white screen! It's a great app with a LOT of potential. I appreciate it. 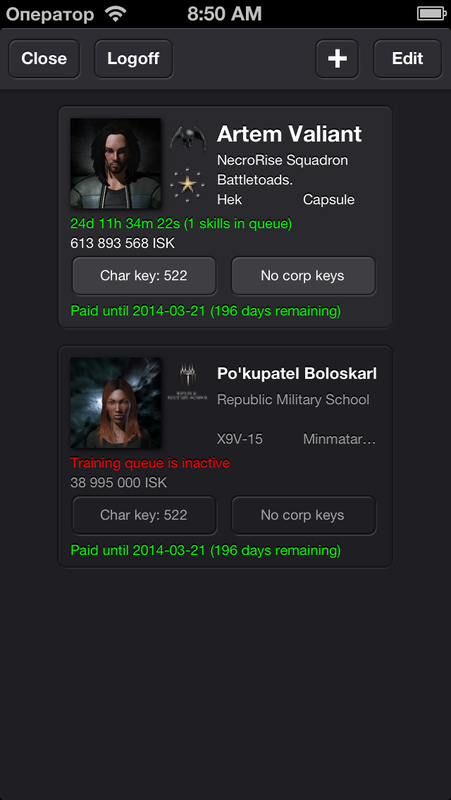 Please implement option to add eve-kill (zkill) favorites. Typing in your details every time is tedious. Installed the app but can't get the API key working. Any suggestions of what I'm doing wrong? 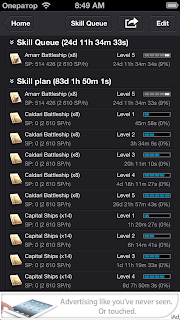 Would you please tell a noob how to use the skill planning feature? Noticed that Facebook account appears to be closed. Is this software still going to be updated?? Is rubicon update in works?? For ppl how are not running this app on IOS 7. Stop complaining and up date you're damn phone. It's apple that's messing things up. This app works fine. Using 4s. And as always the update will take +- 2weeks. If it's coming. hi artem, long time no hear. hope all is well. is the app already at approval at apple? The warp speed is wrong for all ships. I do love this app, and the updates for iOS7 + Rubicon. Just wondering if along with the fits, if we could get a clone planner! Great app! Is there a way to set the default character to use for new fittings? It seems that the default is no skills, which adds 3 clicks to each fit. The fitting engine is off on align times. I suspect this is because of changes in Rubicon. Any idea if these are being looked at? Plan to contribute again either way, but wanted to say thank you for your work. Developing for Android is a PITA thanks to the myriad of hardware configurations and different screen sizes; fragmentation is a big problem so I wouldn't count on it; just buy an iPhone. or an iPad. Bluntly, this is great to have on your iPhone, but on an iPad it really shines. Is there a ETA yet for the update? Hi, is there an update in progress or are we now waiting for the new expansion? has anyone seen the developer? in game or out - seems like something happened and there hasn't been any changes to keep this up with current EVE! Maybe it's the plex prices ;p.
But hope this is not the end of this app. Just sell it to ccp or pass it to some others app build geek to keep it going. Hope artem is oke tho. Just need to be a bit more patience I guess. Hello? Updates coming or not? Hi, I received the update, Nice work. 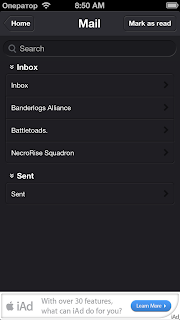 Thanks for taking our suggestions on the interface, I like the spacing in the menus, make selecting much easier. I look forward to your next update.